This faucet is awesome! It's very sleek and modern. Very heavy and well-constructed. My plumber was impressed and said it felt well-built. I would recommend it to anyone looking for something contemporary and interesting. 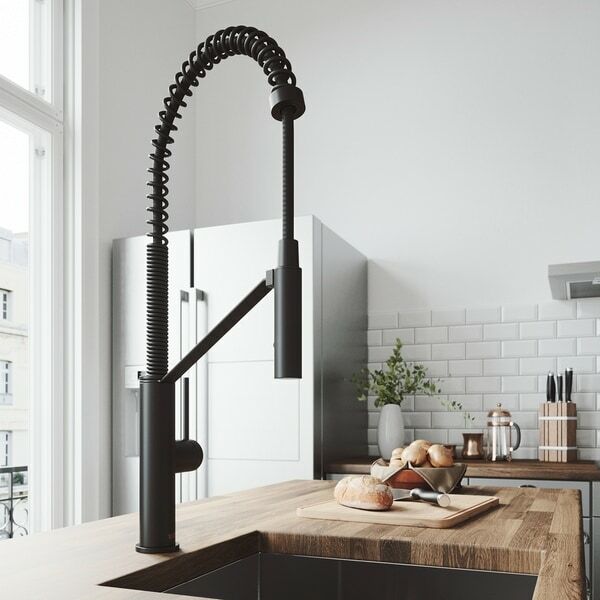 With its sleek design and modern spiral details, the VIGO Livingston Magnetic Kitchen Faucet is the perfect functional fixture for your kitchen. The single handle kitchen faucet features a professional look with an easy to clean spray face. The pull-down spray head switches from aerated flow to spray at the touch of a button for powerful cleaning. An integrated magnetic catch only adds to the functionality, holding the spray head in place when not in use. Dimensions 9.38 In. X 2.13 In. X 23.5 In. I absolutely love this faucet! The water settings are both really nice, the shower option does not spray water everywhere, like my other cheaper faucet did. The matte black finish is super high-end. Also the magnetic feature is magical. I would definitely recommend! Love it ! Looks expensive and has GREAT water pressure! Super easy to install. I have zero experience and did it myself. My husband is a builder and was impressed I was able to take out the old one and install this one. I wanted credit so didn’t let him know just how easy it was. Lol To sum it up ..... I’m not easily impressed nor do I leave reviews so hopefully that expresses how pleasantly surprised I was at looks, price & quality of this Faucet.